"Sparkling Wine in Emerging Asia to 2016: Market Guide" is the result of Canadean’s extensive market research covering the Sparkling Wine market in Emerging Asia. It provides a top-level overview and detailed insight into the operating environment for the Still Wine market in Emerging Asia. It is an essential tool for companies active across the Alcoholic Drinks value chain and for new players that are considering entering the market. The report provides in-depth detail on the trends and drivers of the Sparkling Wine market in Emerging Asia. The quantitative data in the report (historic and forecast market values) analyses the dynamics in the Emerging Asian countries, providing marketers with the essential information to understand their own and their competitors’ position in this market and the information to accurately identify where to compete in the future. 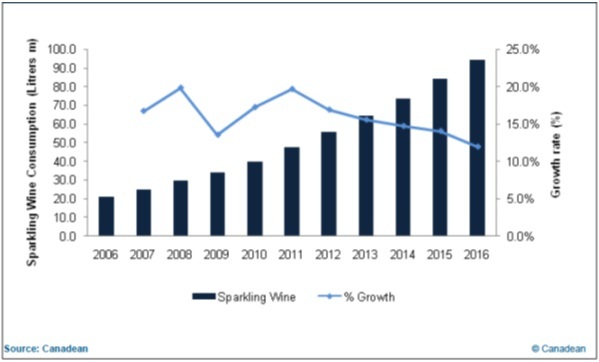 Canadean’s "Sparkling Wine in Emerging Asia to 2016: Market Guide" provides data and analyses to help companies in the Alcoholic Drinks industry better understand the changes in their environment, seize opportunities and formulate crucial business strategies. • Analysis of the Sparkling Wine market and its categories (where applicable), including full consumption values for 2011 and forecasts until 2016. • Historic and forecast consumption values for Still Wine for the period 2007 through to 2016. • Allows you to analyze the market with detailed historic and forecast market values, segmented at category level (where applicable). • Enhances your knowledge of the market with key figures on consumption value and segmentation by category for the historic period. • Supports you in planning future business decisions using forecast figures for the market.